Discussion in 'Wilder Forge' started by Nolan Wilder, Jul 16, 2014. I thought I'd show you all a few pictures of things in my shop being built. Manu Ferrum, beacon, bobs1415 and 5 others like this. You do some very nice work! Keep it up. That third blade from the left, is it spoken for? In this picture? Yes, But I can make another. Manu Ferrum and GoodOlBoy like this. Manu Ferrum, GoodOlBoy and Unistat76 like this. I'm going to use this thread to post pictures of things as I'm working on them. From now on, they will be, more or less, real time pictures. A few pictures of the recently finished Otsi in the works. Working on a little drop point bushcrafter. 1/8" thick O1 tool steel. The blade is about 3.25" long. Yeah, I know 5 pins is over kill. But its going to look cool! Working on a knife with a loop in the pummel. Loving it, keep up the beautiful work! Some cool stuff on the way! Manu Ferrum and pgun1267 like this. Love the seax style blades. Manu Ferrum and Unistat76 like this. Man oh man!! Those edc's are gonna be sweet! My wife is gonna love hers! I'm working on a big'ol chopper. Right after the heat treat I gave it a batoning test. I'm kinda behind on posting up to date stuff. Stay tuned! The last knife on the page with 2 holes in the handle. What's the handle ,blade size ,height,thickness. Do you use Micarta for handles? Totally love this photo and this blade shape! What are handle plans for this one? The handle is 4.5" long. The blade is 4" long, 1/8" thick and about 1.25" wide. I have never tried working with micarta. It sure would! 4" or less and 1/8" thick is absolutely perfect for skinning and field dressing. Thanks! This is pre heat treat. Once that was done I gave it the standered wire brushed finish. It got walnut scales and 4 brass pins. Working on something cool tonight. VERY cool. What are the specs? Thanks! 6" from the guard to the tip of the blade. 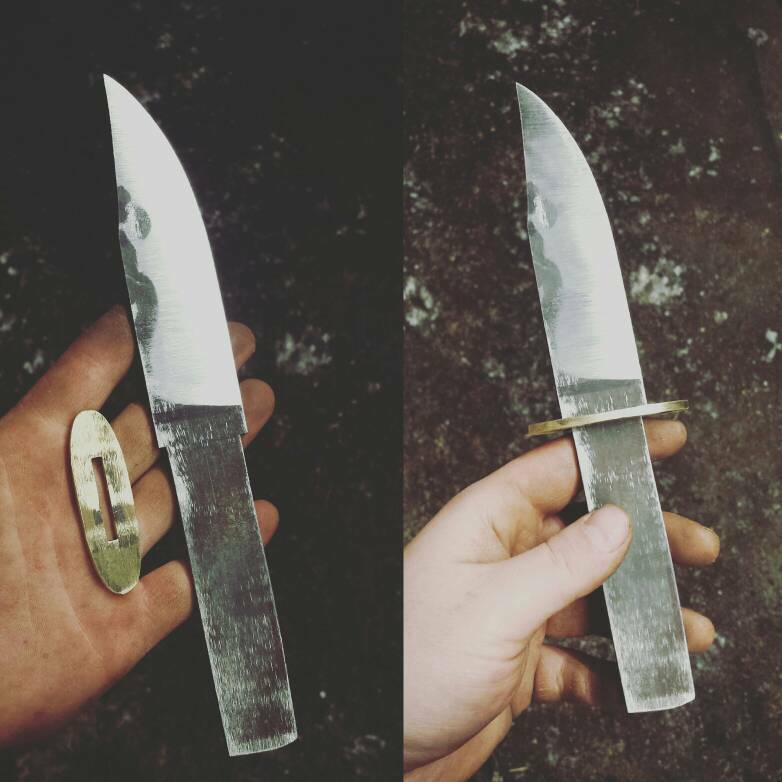 4 3/4" from the guard to the end of the handle. 3/16" thick. This knife has had a hard life. I made it for a trade show almost a year ago. It never sold at the show, I had to list it on line after to get it sold. Originally, it had a traditional butcher blade, but someone put this aggressive clip point into it later. It has switch owners at least once since I've seen it last, and now it's back with me for a makeover. Soon it will be a 5" drop point! Someone concept art for tooled leather to come. I don't to do pre cut stuff. No jigs or assembling parts. Everything that comes out of my shop is made one at a time, by hand and eye, from raw materials. Manu Ferrum and Badey like this. Working on a pretty awesome bowie. Manu Ferrum and brionic like this. Manu Ferrum and Leshy like this. 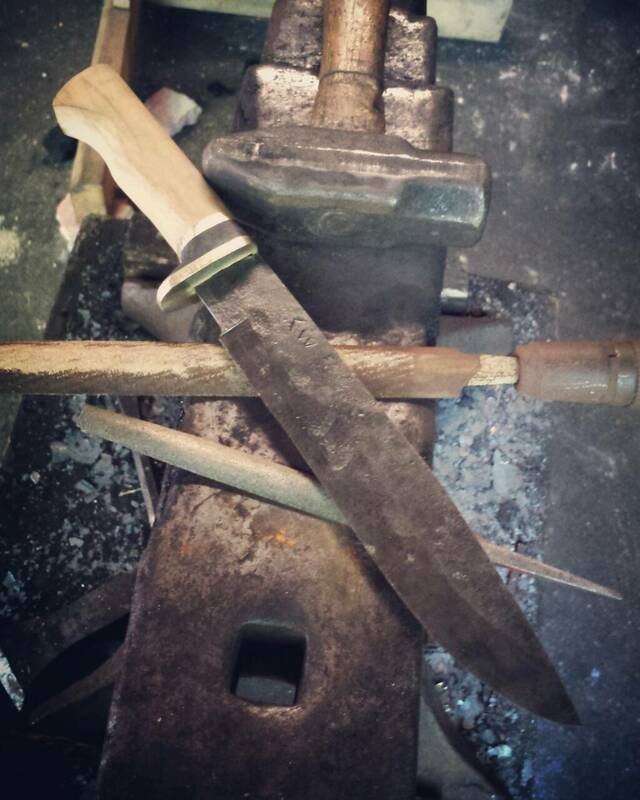 Doing a full flat grind and a brass guard on this 19th century pattern bowie. Manu Ferrum, BillyBogota and Unistat76 like this. Is that the one from Instagram? Working on a pretty cool bowie. 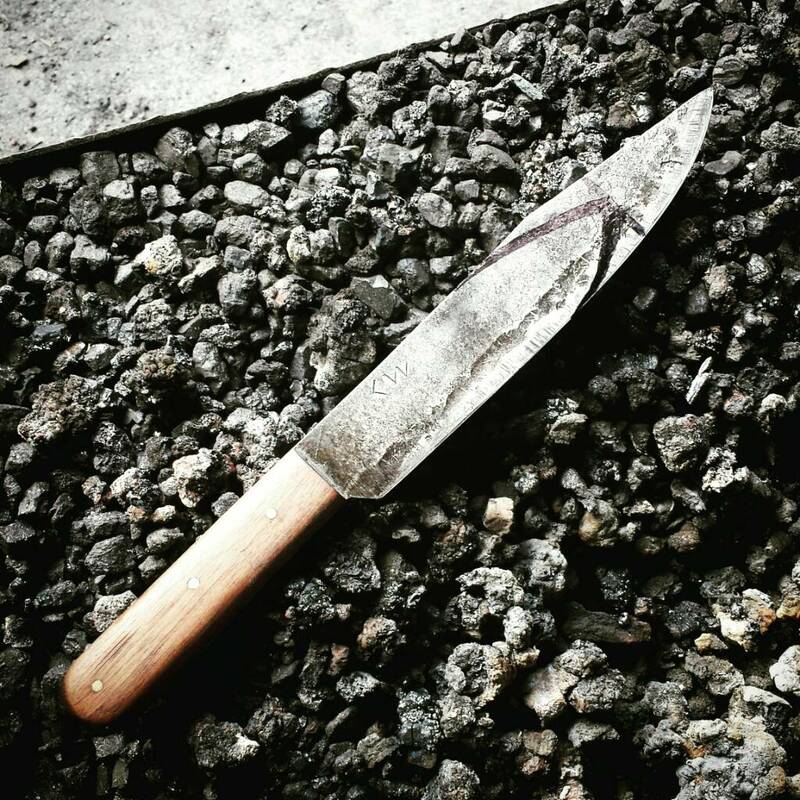 After forging and grinding the knife to shape, I normalize it. Normalizing is a very important step in the process. 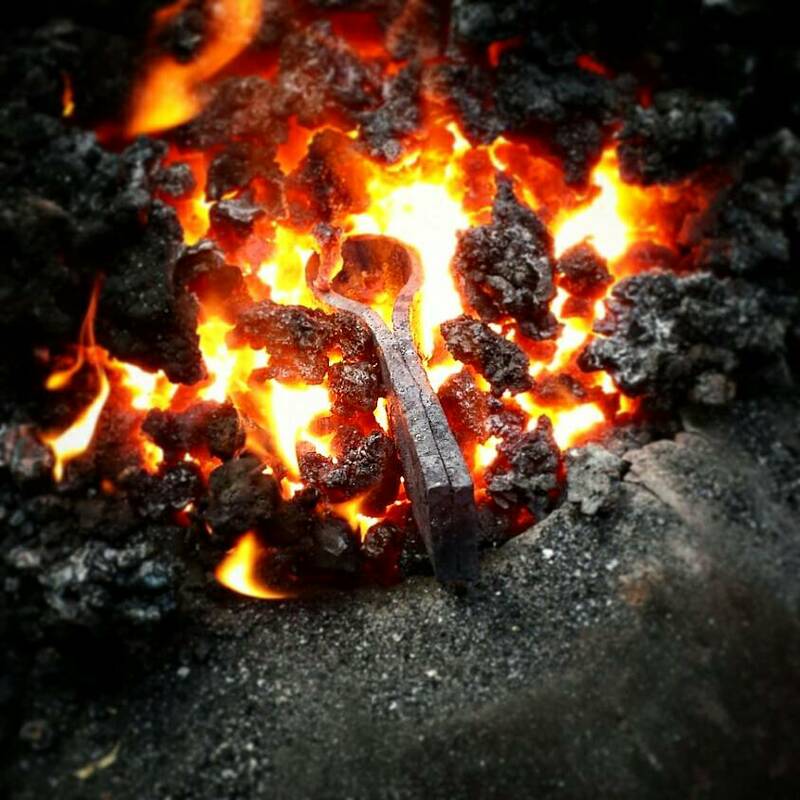 By heating the blade up and letting it cool slowly in the air your allowing any stresses that formed during the forging process to dissipate and the grain structure to become fine and uniform. Unistat76 and Badey like this. Started working on some stacked leather. One is finished and posted in my forum. I'm headed to finish the other this morning. Bitterfists and Huey like this. Hey thanks! I'm glad you like them! Here are some recent projects I'm working on. The Bowie is a custom order.